The remains of a former Lagos State governor and father of billionaire businessman � Femi Otedola � Sir Michael Otedola, who died in April, have been laid to rest. Sir Otedola�s final journey home was on a grand note in his native, Epe town amid tight security on Friday. On hand to bid the former governor farewell as he ended his earthly sojourn were President Goodluck Jonathan, ex-President Olusegun Obasanjo and Governor Babatunde Fashola of Lagos State. 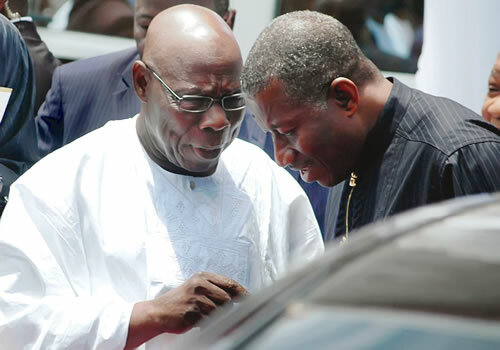 In his sermon at the Immaculate Conception Catholic Church, Ibowon, Epe Local Government, Monsignor Philip Hoteyin, Chaplain of Marian Shrine, Lagos Catholic Diocese, urged President Jonathan to strengthen the unity in the country. Hoteyin said: �Nigerians are everywhere. Everywhere you visit Nigeria is regarded as the greatest. Let us remain one of the greatest countries that we have always been�. The chaplain noted that the country was regarded as a family, adding that efforts must be made to keep the country united. Monsignor Hoteyin urged Nigerians not to forget that they are visitors on earth and would one day be called home. Though attendance at the burial ceremony was strictly by invitation, dignitaries that graced the event included the First Lady, Dame Patience Jonathan and wife of Lagos State Governor, Dame Abimbola Fashola.